Knowledge of antenna installation and maintenance is especially important as these tasks are performed by the aircraft technician. Antennas take many forms and sizes dependent upon the frequency of the transmitter and receiver to which they are connected. Airborne antennas must be mechanically secure. The air loads on an antenna are significant and must be considered. Antennas must be electrically matched to the receiver and transmitter which they serve. They must also be mounted in interference free locations and in areas where signals can be optimally transmitted and received. Antennas must also have the same polarization as the ground station. The following procedures describe the installation of a typical rigid antenna. They are presented as an example only. Always follow the manufacturer’s instructions when installing any antenna. An incorrect antenna installation could cause equipment failure. 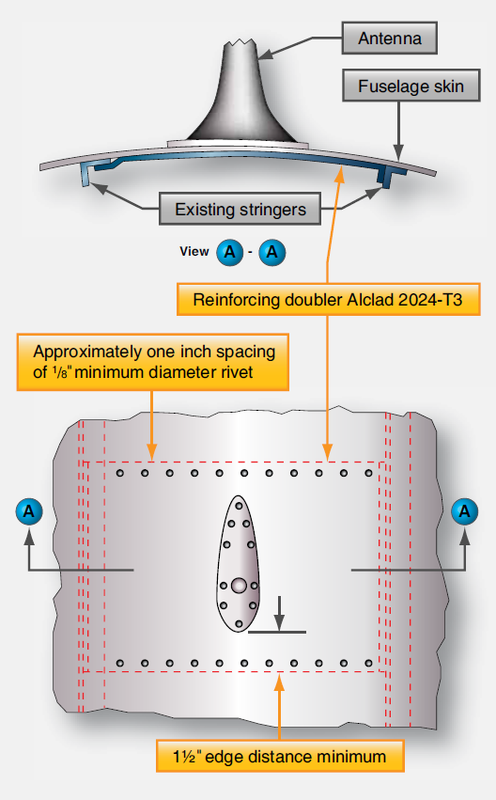 Install a reinforcing doubler of sufficient thickness to reinforce the aircraft skin. The length and width of the reinforcing plate should approximate the example shown in Figure 2. Install the antenna on the fuselage, making sure that the mounting bolts are tightened firmly against the reinforcing doubler, and the mast is drawn tight against the gasket. If a gasket is not used, seal between the mast and the fuselage with a suitable sealer, such as zinc chromate paste or equivalent. The mounting bases of antennas vary in shape and sizes; however, the aforementioned installation procedure is typical of mast-type antenna installations. A transmitting or receiving antenna is connected directly to its associated transmitter or receiver by a transmission line. 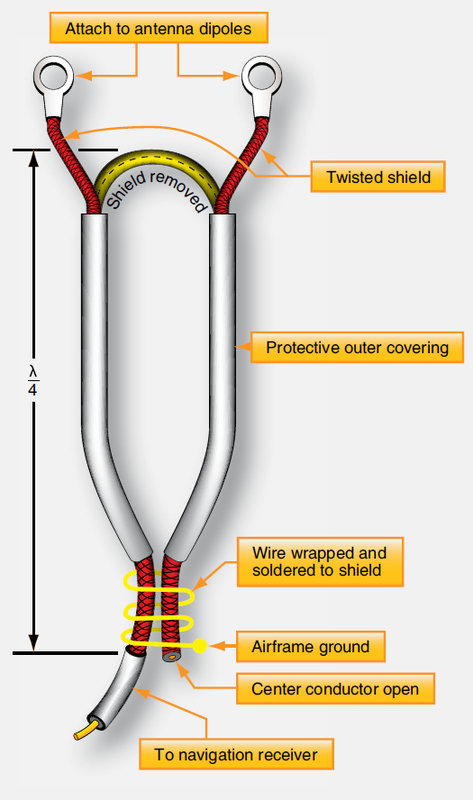 This is a shielded wire also known as coax. Transmission lines may vary from only a few feet to many feet in length. They must transfer energy with minimal loss. Transponders, DME and other pulse type transceivers require transmission lines that are precise in length. 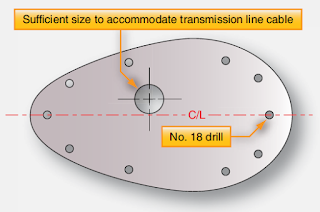 The critical length of transmission lines provides minimal attenuation of the transmitted or received signal. Refer to the equipment manufacturer’s installation manual for the type and allowable length of transmission lines. To provide the proper impedance matching for the most efficient power transfer, a balun may be used in some antenna installations. It is formed in the transmission line connection to the antenna. A balun in a dipole antenna installation is illustrated in Figure 3. Coax connectors are usually used with coax cable to ensure a secure connection. Many transmission lines are part of the equipment installation kit with connectors previously installed. The aircraft technician is also able to install these connectors on coax. Figure 4 illustrates the basic steps used when installing a coax cable connector. When installing coaxial cable, secure the cables firmly along their entire length at intervals of approximately 2 feet. To assure optimum operation, coaxial cables should not be routed or tied to other wire bundles. When bending coaxial cable, be sure that the bend is at least 10 times the size of the cable diameter. In all cases, follow the equipment manufacturer’s instructions. Detailed instructions, procedures, and specifications for the servicing of avionics equipment are contained in the manufacturer’s operating manuals. Additional instructions for removal and installation of the units are contained in the maintenance manual for the aircraft in which the equipment is installed. Although an installation may appear to be a simple procedure, many avionics troubles are attributed to careless oversights during equipment replacement. Loose cable connections, switched cable terminations, improper bonding, worn shock mounts, improper safety wiring, and failure to perform an operational check after installation may result in poor performance or inoperative avionics.